Gold has moved in a $75 range for nearly two months now as shown on the chart as shown above. Goldman Sachs have a bearish view, contrary to many, predicting $1000 by the year end Are Goldman correct on gold? . On Friday, Australia’s Department of Industry joined them in their bearish view predicting $1105 in 2017 and by 2021, $1003. Australia, who are the second largest gold producer in the world, suggest that increasing interest rates lower the appeal of gold by making other assets more attractive, and expect that the dollar will rise as capital flows into the U.S. seeking higher returns. Australia expect their gold production to continue to rise until 2018/19. Gold rallies, but it may find it difficult to break above the 200 week EMA. To the downside, the 1200 level could still act as support. The 200 week EMA has proven to be a good resistance zone for gold and the precious metal may drop again into the congestion area. There is a bearish trend developing on GOLD. I think that the XAU/USD asset would renew its maximum/minimum. I can see two scenarios here – the basic (1) and alternative (2). I can’t see a favorable opening for a deal right now. Therefore, I’ll wait to see which of the variants is the right one. 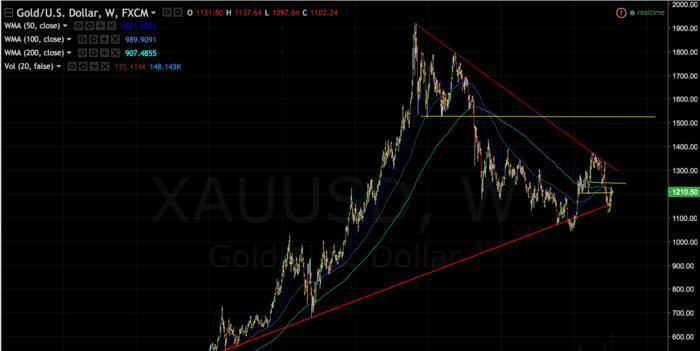 What do you think about this gold analysis? It seems to me that the asset will go for breaking the bottom line after reflecting from the upper bound. 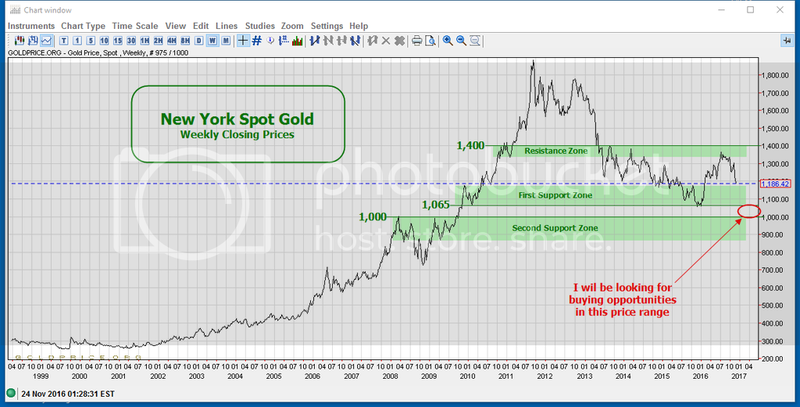 I’m expecting gold to penetrate the [I]first support zone[/I] and test the 1,065 level in the next 2-4 months. • If 1,065 becomes strong support, I will be a [I]cautious buyer[/I] as price rises above that level. • If the 1,065 support level is broken decisively, I think the 1,000 price level will be tested. I then expect some penetration of the [I]second support zone,[/I] but I will not be a buyer within that zone. I will wait for price to move back above 1,000 and establish 1,000 as strong support. If that happens, I will be a strong buyer above 1,000 as price is rising (as noted by the red ellipse on the chart). Note: I do not trade in and out of gold on a short-term basis. All of the above is part of a long-term bullion accumulation strategy. watch out for 1142. very likely that from 1142 we see a short term rally towards 1191 before it continues further towards 1000 (and below 1000). anyways, going short on 1192 to 1050 and by demand holding longer towards 1000. Great analysis but ill take the opposite side here. Gold is in a giant wedge… moving up now until another breather around $1250… then hits around $1300 (and where the slope of the wedge would be) consolidates and we resume this very long term bull market (USD will depreciate too – why? b/c everyone thinks the opposite). Keep up the great work.